The baneful fountain rises here. At long last we visit another well with a widespread reputation, one that I admit to having put off describing for as long as possible for fear of failing to do it justice. 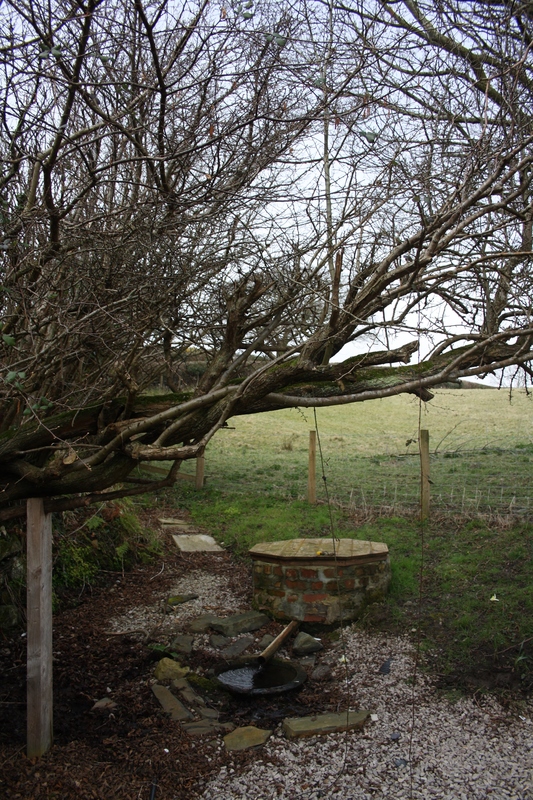 This is the well of St Elian at Llanelian yn Rhos near Colwyn Bay. The reputation of Ffynnon Elian has spread far and wide, and really for the wrong reasons because from the late 18th century and for much of the 19th century it appears to have been a predominantly bad reputation. The above is drawn from a lengthy dramatic poem by the youthful Charlotte Wardle published in 1814 and titled St Elian’s or the Cursing Well. It is said that the well first sprang forth at the request of a thirsty St Elian in the 6th century and that in thankfulness for the water, he prayed that whoever should come to the well with faith would be granted their wish. Lhuyd in 1699 (cited in Lives of the British Saints) refers to rituals and offerings carried out there for the cure of sick children. However, while for the vast majority of its active life the spring may have enjoyed a favourable reputation and was resorted to for healing well it is perhaps inevitable that given such powers it should be those who wished evil rather than those who wished good might eventually take precedence and give the spring such an undeserved bad name and it is difficult not to dwell on this aspect of its history here. We are told that cursing became a big business during the 18th century, with unscrupulous well guardians growing rich by taking advantage of the supposed powers of the spring for their own ends. The idea of a facilitator at the well was not limited to this location and appears to have been a relatively common practice – someone who knew the required procedures that should be followed to ensure the efficacy of the approach to the well and someone willing to take donations, either, as in this case, for their own or in other cases for the church or communities benefit. When Charlotte Wardle wrote in 1814 the practice appears to be firmly established here, her dramatic piece imagines a local hag paid to place a curse on behalf of the villain of the piece on his enemy. Repeats her orgies o’er again. There was apparently quite an established scale of charges in the early 19th century for cursing at the well, providing both a fee for laying on a curse and a substantially higher one for removing the curse again – thus the well attendant could profit twice and some seemed able to do very well for themselves for providing this service. But probably, side by side with its duties as a curing well, people would have continued to visit for its original, more positive, reasons. The practice documented by Lhuyd includes the need to empty the well three times during the ritual, a process remembered in the passage from Wardle’s poem quoted above which demonstrates the persistence of the customs, albeit being applied for very different purposes. 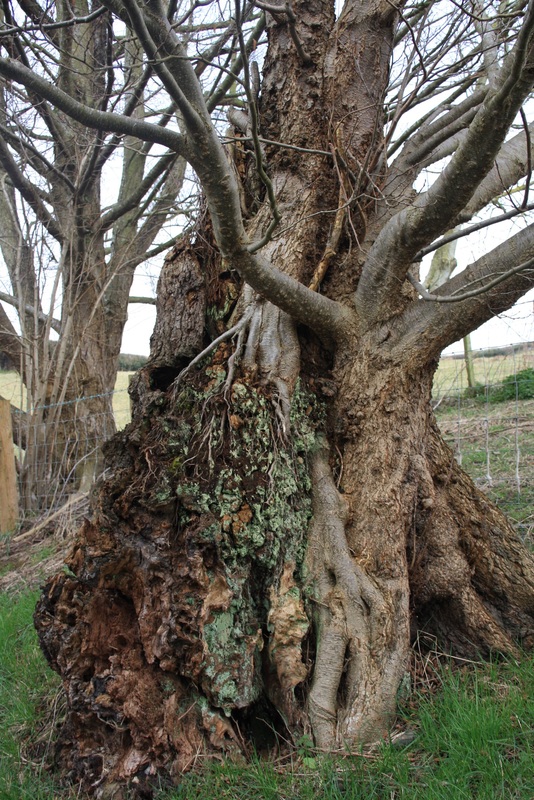 Rhys tells of a meeting with an old woman at the well which must have occurred in the 1860s. She could recall pieces of rag being tied to branches of trees around the well with wool. Traditionally this was done around wells by those in search of a cure. This must place the presence of rags around the well in the early 19th century implying double use for curing and cursing even then. She stressed that here natural wool rather than anything that had been spun or treated should be used. The same account refers to sightings of corks with pins stuck into them floating on the well surface. These too had been a common sight throughout the earlier part of the century and these were taken to be emblematic of curses. The spring was described in 1816 as being circular in shape with a diameter of about 30 inches, covered with a stone arch and sods and enclosed by a strong square wall 7 feet high. It lay in the corner of a field within a grove of trees. (Pugh, 1816 cited by Baring Gould and Fisher). They quote a source suggesting that this structure was destroyed around 1829 in response to the reputation of the well. However a spring is not that easily stopped and customs continued at the site throughout most of the century. Janet Bord cites a number of cases of individuals suffering in the belief that they had been cursed at the well. 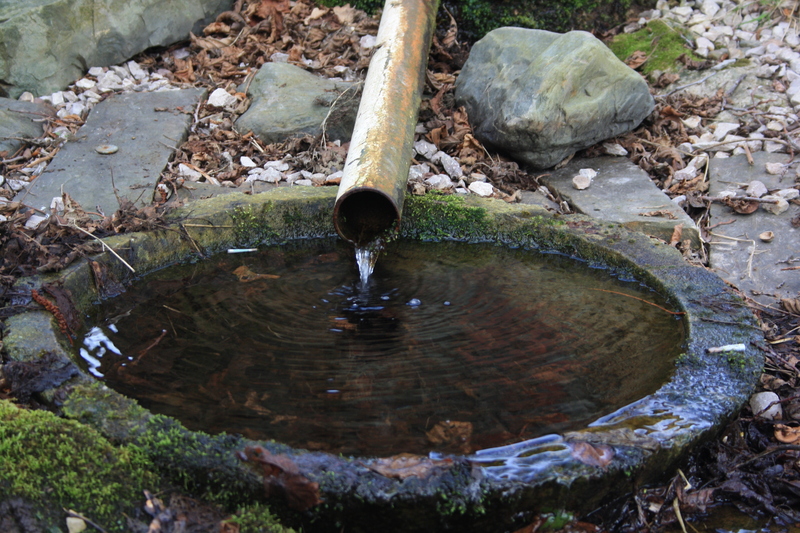 The spring has recently been restored by its present owner and historian and is now used to provide a water supply to the nearby house. In memory of its previous history a pipe leads from the bricked up well head feeding a shallow circular basin close by where it collects before running away down the hillside. 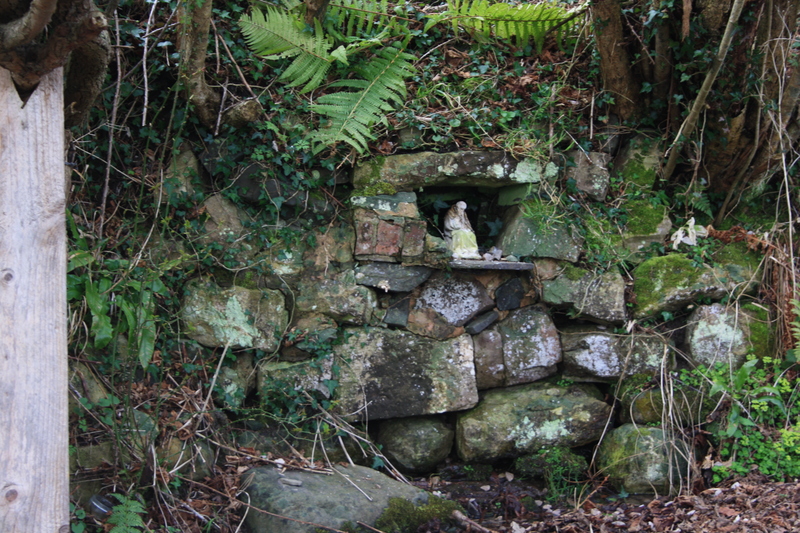 A stone wall in the nearby bank provides a niche where a small figurine – representing St Elian perhaps, sits; surrounded by the remains of a number of burnt out candles. 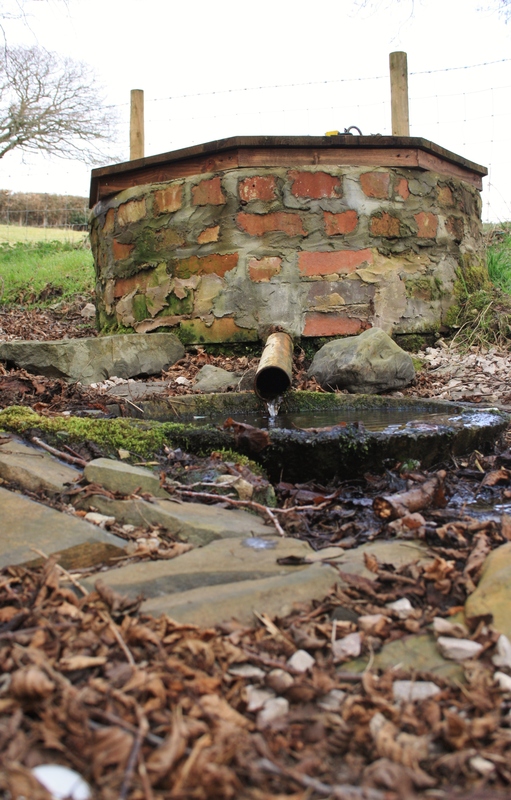 It is indeed curious that the two wells we have seen in North Wales that both have this reputation of double use in cursing and healing are both dedicated to Elian, the other being at Llaneilian on Anglesey,, although we should remember that cursing at wells is more widespread and not a peculiar preserve of these two sites. There is nothing in St Elian’s life that indicates a predisposition for cursing so although possibly the tradition has spread from one to the other by association with the name or maybe it is just pure coincidence. The conclusion is that both have a much worse reputation than they really deserve. Charlotte Wardle (1814) St Elian’s or the Cursing Well. John Rhys (1893) Sacred Wells in Wales, Folklore Vol 4. A full history of this well has been written by Jane Beckerman, available as a self published book through Amazon. Unholy Water? Ffynnon Elian ‘The Cursing Well’. 2017. Fascinating post and wonderful photos as always. So look forward to your posts~ always entertain and educate as well.